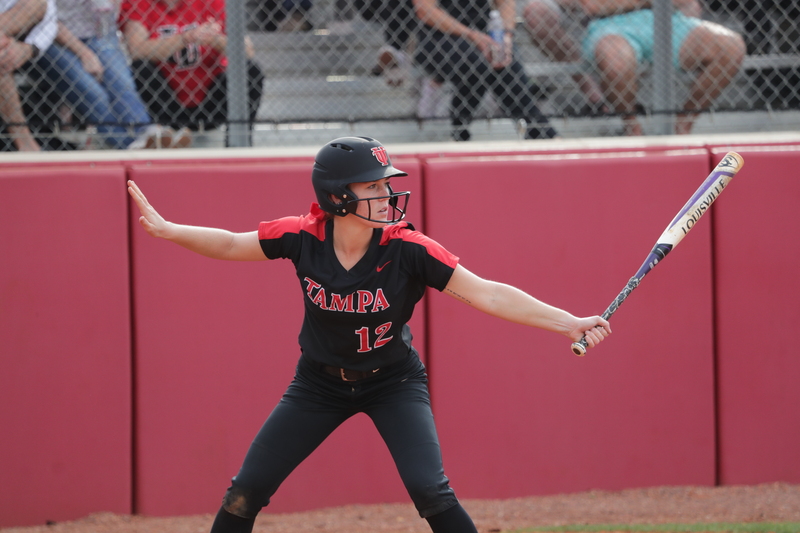 2/3/2018; Tampa, Fla.; University of Tampa softball vs. Warner University. The women’s softball team kicked off their season this past weekend with a double header at home against Warner University. The season started out smoothly as the Spartans won both games with a score of 6-1 and 4-2. After falling just short of the Sunshine State Conference Champions (SSC) last season, the Spartans are hungry and determined to get revenge this season. “I think that as a team our goal is to really just out work every other team on top. We want people to be worried about playing us, and we all want to be on top,” said junior pitcher Makaleigh Dooley. In game one, junior second baseman Erica Matich drove in the first run of the year for the Spartans, allowing senior outfielder Shelby Press to score in the second inning. Warner tied in the game at the top of the sixth inning, but UT bounced right back to drive in five runs. Like déjà vu, Matich drove in Press again to make the score 2-1. Senior outfielder Sahrina Cortes proceeded to hit a single down the right field line, allowing Matich to score. Junior shortstop Cristina Clauberg kept the inning going with a single as Dooley drove two runs in with a double to center field. The final run of the game came as freshman pinch runner Mackenzie Allen scored off a triple from sophomore Corynn Miner. Dooley threw a complete game for the Spartans, with 85 pitches thrown in total, 66 of them being strikes. After an impressive season last year, Dooley was looking to start the Spartans off with a strong start. “Last season we fell a little short and didn’t come out on top like we had planned so it feels good to come back out and take care of some unfinished business. Getting these first two wins was super important for all of us. These first few games really set the tone for the rest of the season and really gives us a good look at what we are working with. Plus, winning always feels good, not matter who you play,” Dooley said. In the second game, Warner scored first followed by a quick run batted in as Cortes hit a double then advanced to third base. Dooley hit a sacrifice fly, tying the score at 1-1. Warner scored again in the fourth inning, regaining the lead 2-1. Clauberg advanced to second base with a sacrifice fly from Dooley. Junior outfielder Breanna Taphouse came in at second as a pinch running and scored from sophomore Maddie Farrell’s double. In the sixth inning with a tie game, Clauberg singled then advanced to second base from a sacrifice fly from Dooley. The highlight of the game happened when freshman utility player Bailey Philips hit a bomb almost out of the park, advancing to third base with a triple. Farrell drove her in, winning the game 4-2. After a successful first two games, head coach Leslie Kanter and Dooley were proud of the positive outcome for her team. “I am happy with the pitching and with way we hit the ball. I thought we made a couple mistakes on defense but they are fixable mistakes. All in all, it was a good start,” Kanter said. “One of our goals is to make it to the postseason and let all of this hard work pay off. When we are conditioning and getting tired, coach always tells us that we have to want it more than the other teams, and that we have to work harder than any other team,” Dooley said. Coach Kanter has similar feelings and believes her team has what it takes to reach the next level. “Our goal is always to win the conference. Whether we win it or not, our next goal is to go to post season. We have never made it past regionals so doing that would be icing on the cake,” Kanter said. The Spartans are set to take on West Georgia on Feb. 8 in a doubleheader and Valdosta State in a doubleheader on Feb. 10 in their next upcoming match ups.